With thanks to my contact at Armand Nicolet, Bobak Sabzevari, who worked closely with me to make this article happen. I was introduced to Armand Nicolet in late 2013 and have followed them ever since. Founded in 1875, Armand Nicolet is perhaps not the first name you think of when you picture a Swiss-made luxury watch. As a boutique firm, their presence is much smaller than the national heavyweights – the Omega’s and Rolex’s of the world – but their small size is an essential part of their charm. Rolex produces an estimated 4,000 watches per day and employs nearly 5,000 people, whereas Armand Nicolet will produce around 6,500 watches annually with a staff of just 20. Today, the horological world is undergoing an existential crisis, and boutiques like Armand Nicolet are storied reminders of the value that watchmaking tradition – and the genuine beauty – that handmade precision and time-honoured expertise bestow on a timepiece. As a company of watchmakers, their philosophy toward horology is different than larger enterprises and thus their watches retain a certain level of authenticity and sentiment that other luxury timepieces may not. It’s hard to place a value on that quality, but there’s no denying that such is a quality that every Armand Nicolet posses. I know first-hand: I acquired my first – a 2012 model M02 with an ETA 2834-2 automatic – in 2013, and it’s been a faithful companion of my left wrist ever since. Armand Nicolet makes watches for people that appreciate when watches are made with purpose and passion, and where the story behind the watch is almost as interesting as the watch itself. This is a company that creates watches, not one that merely manufactures them, and it’s that distinction that makes them special. Not “A” M02, The M02! Bobak Sabzevari, Armand Nicolet’s marketing manager, furnished me with a blue calf-leather strap’d and dial’d M02 Complete Calendar for this article and photoshoot. He replied, “No Cameron, I sent the M02!”. And so he did; the M02 Complete Calendar in the navy on steel bracelet configuration is my personal “holy grail”, and here it was before me. Armand Nicolet was founded in 1875 in a small Swiss mountain village, Tramelan, though their watchmaking experience is multi-generational. The company carries the namesake of its founder, who was the son of a watchmaker and inherited the love for horology and watchmaking. By the early 1900s, Armand Nicolet was creating pocket watches that featured intricate and complex complications. Guilloche cases and dials, mono-pusher chronographs, and complete calendar complications were among the functions and details that were methodically placed in each pocket watch that left the factory. In 1939, control of the company was passed to Armand’s son, Willy, after Armand’s passing. Under Willy’s leadership, the company weathered the “quartz crisis” of the ’70s, adapting to survive in a new horological environment. They leveraged their skill and knowledge in watchmaking, relying on years of trust they had earned as notable Swiss watchmakers, and began to prioritize and expand their movement-assembly operations. As the quartz crisis thrust the industry into a new reality, Armand Nicolet focused their efforts on manufacturing movements on behalf of other watchmakers. This allowed them to stay busy while they grew their business and endured the economic storm. During these difficult times, their reputation as an excellent T1 movement assembler allowed them to survive and adapt to the dramatic change in the market. Still, despite the change the company would undergo in order to survive in this new world, it did not lose the values that define it. The Calibre AN 9201/2846 automatic movement. Staying true to traditional methods while utilizing the latest technological advancements is a challenge in any industry. This is certainly true of watchmaking, where automated manufacturing of watch movements and increased global competition – combined with a shift in consumer perception of watches in general – are driving change in the industry. Armand Nicolet sees the preservation of watchmaking knowledge as an essential component of their identity. What does that look like, and how is Armand Nicolet pursuing that goal? Typical of their hands-on nature, Armand Nicolet is taking a leadership role in helping a new generation of enthusiasts develop an interest in the appreciation and manufacture of mechanical wristwatches. They invest heavily in the development of young watchmakers, developing an in-house teaching program with a dedicated classroom at their factory in Tramelan. As new watchmakers join Armand Nicolet, they are given careful instruction in the time-honoured practices of watchmaking. Armand Nicolet affords its watchmakers a unique opportunity – by virtue of their O.H.M Collection – to build knowledge of both contemporary watchmaking as well as the techniques and practices necessary to care for and build upon vintage mechanical movements. Juxtaposed against the ever-advancing forces that are reshaping the industry, the O.H.M Collection is a refreshing reminder of watchmaking’s past. Using movements from days gone by, Armand Nicolet refurbishes and enhances the vintage mechanicals to give them a new life in a contemporary timepiece. Each year, Armand Nicolet builds between 2,000 and 2,500 watches that bear the O.H.M label. This practice, on a scale that is unique to Armand Nicolet, is a pillar of their identity as both a brand and collection of watchmakers. It’s one that resonates with me personally; the O.H.M Collection satisfies many of the values that I hold dear, including the importance of sustainability. Producing a watch that will bear the O.H.M label is a labor-intensive process – one that requires hands-on training and guidance – as the O.H.M Collection challenges even seasoned watchmakers. The vintage base movements were built before CAD assisted the design and engineering of a timepiece. As a result, considerable experience, patience, and human ingenuity are required to see the manufacture of an O.H.M timepiece through to completion. The L15 – beautiful and perfectly-sized (at 39mm) – is an underappreciated gem of the horological world; a stunning example of modern style and taste combined with vintage mechanical precision. The same is true of the 34mm LL9, which uses a movement from 1960 that is proudly displayed in the open-heart dial. Due to the rarity of the source movements, the O.H.M Collection is limited, with the L15 limited to 499 pieces and the LL9 to 500. The same level of care and precision that we see in the O.H.M Collection is also given to the contemporary collection, which makes use of modern movements. In most cases, Armand Nicolet takes high-grade Swiss movements and heavily customizes them so the movement suits their intended application. The M02 is one of the more popular of Armand Nicolet’s collections. Shown here is the Complete Calendar, with uses the AN 9201/2846 automatic movement (which is based on a substantially-modified ETA 2824). Adding the complete calendar functions, including a moonphase display, transforms the ETA 2824 into a complicated movement indeed. As it so happened, the M02 arrived a few days prior to my 31st birthday. With Bobak’s encouragement, I wore the M02 for the day to the office and out for the evening. Comfortable, but weighty – the movement is quite robust, after all – and very much the quality that I’d come to expect from AN. I adore the HS2 collection, which is a gorgeous example of traditional style embodied with contemporary tastes. The HS2 is one of the best looking timepieces available today (in my humble opinion). 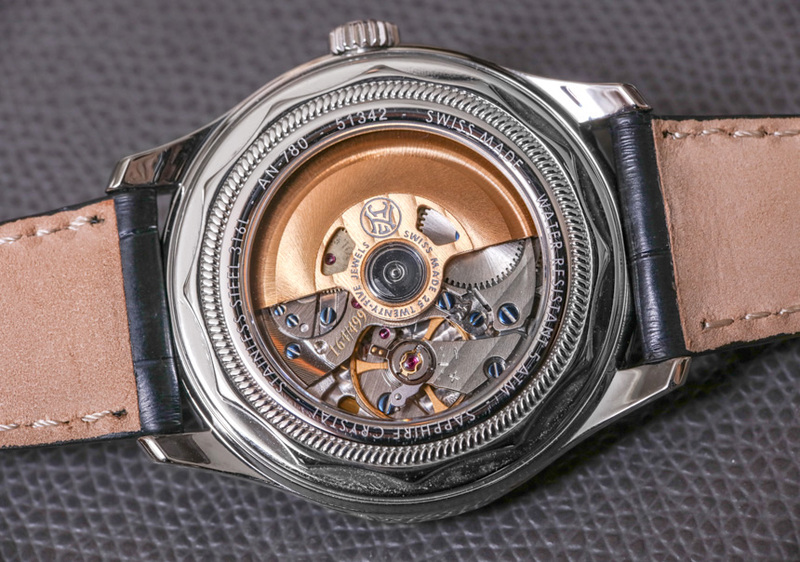 The HS2 employs very distinct styling as well as a unique movement that provides the HS2 with a rare personality (compared to other timepieces). As Horbiter puts it, “the HS2 combines the benefits of a digital display with the beauty of an automatic mechanical caliber“. Armand Nicolet faces the future with confidence and optimism that could only come from a company with a legacy that spans over 110+ years. As much as they hold dear the traditions and values tied with historic watchmaking, they also embrace the march of progress and are again taking a leadership role. Launched earlier this year, the trade-in program allows watch enthusiasts to receive a quote on their existing timepieces as a credit towards a new Armand Nicolet. This program is unique to Armand Nicolet. Armand Nicolet also has their sights on reaching a global audience, making smart investments in digital media and social media to support their growing network of authorized retailers. They’re savvy, too: our collaboration together, and this article, came to pass after we connected via Facebook messenger. Our number 1 objective is to make our customers happy, with both our watches and our service…. Since I began my journey into the world of horology (with the launch of WYCA in 2013), Armand Nicolet remains the most special out of all the manufacturers I’ve encountered to date. Of the hundreds of watches that I’ve held, worn, and photographed, it’s the Armand’s that stand-out for having made a lasting impression. That is a fact worthy of celebration.